Modern dramas maybe "okay" but historical dramas maybe worst because it really takes times, but subs are done 1 - 2 hours, not make sense! I don't think so. I still have an access to all of the dramas mentioned as expiried before - Swallow The Sun, Trot Lovers, Protect The Boss, Coffee Prince, Prosecutor Princess. And I think it's been even more than 24 hours, while the time difference with America is like 6-9 hours. It could be the way you think. From the shows that are already said to beÂ´expiredÂ´ that I can still watch, iÂ´m not going to start on the risk that theyÂ´ll become unavailable in a couple of hours or days. Maybe it depends on PC or iOS that will make dramas available or not! Mir jedenfalls passiert, obwohl ich es schon gemacht habe. @lutra japp, ging mir auch so ^^ mal sehen, was das bringen soll.. But I hope the expiring license rain will stop soon, it's so depressing and demotivating to see our hard work gone. Either you are not too long with viki, you might drop it and go. Or if you are just doing your thing, you might not even be aware of what is happening right now. Today? Oh, I was just binge watching these past days, and I noticed a lot of things that needed editing. Now I'm just going to re-download the subs. Had been watching School 2013 & To The Beautiful You for the first time, started a couple months ago (I like to take things ~slow, lol) & was halfway thru, now both are region-locked. Master's Sun expires on July 17th, based on what the staff sent me. : Which one is next? I just spent a whole morning on that. All I'm going to say about that is they better not stream Viki's subs. Kocowa is launching for American viewers now and has plans to expand to other parts of the world in the future. DF has been saying that from a get go. It's a LIE. That's not exactly how this site works, as 95% of Kor-eng subbers live in North America, and usually you need to translate a drama to English before it can be translated to other languages. Just to qualify what I said, I got the mod right when I was almost done watching Good Doctor. So I've only edited Ep. 16-20. That is a lot of licenses to lose. 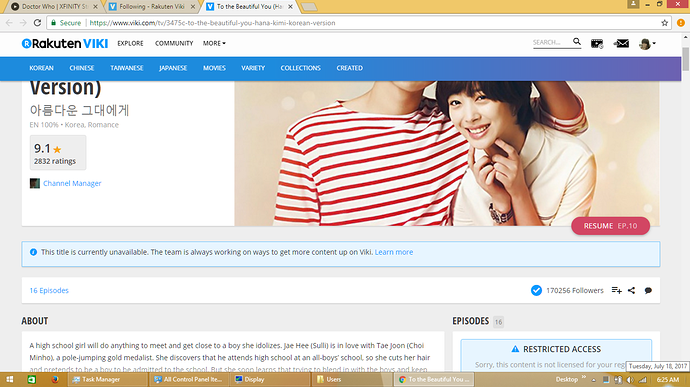 Not good for Viki but I'm not really impressed with the Korean broadcasters trying to monopolize and cash in. I'll almost certainly be sitting out their new platform. Netflix is cheaper and offers a lot more content. I understand that's not exactly how things work (more often than not niche products cost more) but it's how I value them. I guess in a dream world maybe Viki expands content from other regions but that also seems unlikely. That's a pity. I guess that'll reduce my watching portfolio. I'm willing to subscribe to one service that offers many different interesting series, but not to several each only offering a few. Oops. Now I went and redownloaded the whole thing. No worries, it wasn't difficult. Update: Double oops. You meant Good Doctor and I understood Great Doctor (Faith). Totally agree at this point. I know some people get upset that "the other websites" take the dramas and remove our watermark that it was a Viki team collaboration. But at this point, if they didn't take these dramas and put them in their websites, we'd have nothing to show. Let's all be real... We all know what dramas are Viki and what dramas are "the other white meat." All of our work is "saved" on other streaming sites. It's very sad that WE have to depend on these illegal sites to rewatch the classics or dramas that might just disappear. I'm sure some of us remember old internet sites that had dramas we can't find anymore (before DF shut them down). I really wish Viki could be THAT website that people depend on to see the old dramas, the ones we loved that brought us to where we are now.